I’ve seen it many times: A job seeker approaches a recruiter and asks, “So, what does your organization do?” This type of question is often met with a brochure or a suggestion to visit the organization’s website. The job seeker is dismissed - and their job search continues. 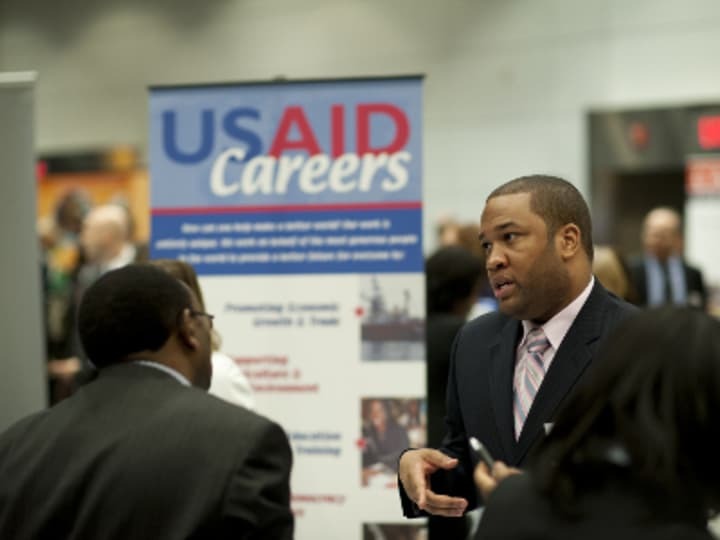 As we gear up for the Fourth Annual Devex International Development Career Fair in Washington, the first bit of advice I often give to participants is to do your research in advance of the event. Know who will be there, what they do and what positions they have open. Then prepare your pitch in advance. Even if you do manage to grab the recruiter’s attention and he or she responds with a well rehearsed description of their organization, you have just missed a crucial opportunity. A career fair is not about learning the basic details of the hiring organizations. It is a rare opportunity to show recruiters what you do and tell your story. It is also a place to learn the kind of information not readily available on a website. For example, the organization’s culture, future plans for growth or what an average day is like on the job. You only have a few minutes of a recruiter’s attention, so if you start from zero, you are not making the most of that time. Doing your research in advance will let you start from a more informed place and have a more fruitful discussion. It will also show the recruiter that you are organized, motivated and have given thought to them as an employer. The good news: Devex offers a resource to Career Account holders that will make this research even easier to do in advance. Our new organization directory features more than 9,000 major hiring organizations in international development, humanitarian aid and global health, including most of those who will be in attendance at the fair. This directory is an invaluable bank of knowledge for any career fair attendee, or any job seeker for that matter. While still in beta, the organization directory will let Career Account holders filter organizations by keyword, organizational type, number of staff, headquarter locations, field locations and funders. Each profile includes an overview of an organization, a word cloud to help illustrate its sectoral experience, a map highlighting headquarters and field office locations, and some basic stats including organizational type, staff size, date they were founded and annual budget. All of this information could have easily used up all of your time with a recruiter — instead, we give it to you all in one concise page! Each organization’s profile also includes a “Career” tab, which provides a robust overview of the career opportunities available at a given organization. Not only do we list the current job opportunities posted on Devex, but an archive of expired opportunities as well. Even though these positions are no longer open, this can give you an idea of the kinds of positions and expertise this organization has historically needed. This is a good clue of what their anticipated needs may be. Current opportunities are displayed on a map so you can easily visualize where in the world they have hiring needs. We also provide an analysis of their recruitment volume and links to any relevant Devex career articles about that organization. You’ve now saved another couple minutes of the recruiter’s time, knowing what openings are right for you or what kinds of openings they tend to hire for that may be right for you in the future. With all of the basic information out of the way, you can now impress the recruiter with your knowledge of their organization and ask thoughtful questions to build on this information or better, explain how your skills and experiences will be a good fit for the work that they do. Before you’re set to meet with recruiters, make a plan of action, prioritizing your top employers and preparing what you want to tell or ask them. Preparing in advance can also help ease any nerves or anxiety about what to say or do once you’re at the event. And if you leave the career fair without any prospective jobs in sight, don’t feel deflated. The goal of an event like this isn’t to just get a job — though that does happen occasionally — but to meet people face to face, make connections and let recruiters put a face with your name. So that when they need someone like you in the future, you are the first to come to mind.